eStandardSolutions.com offers a logical approach to the growing concern over tank inspections. A tank is in standard if inspections and tests are completed at specified intervals by registered facilities. But accessing data regarding those inspections to ascertain current disposition is tedious and cumbersome. 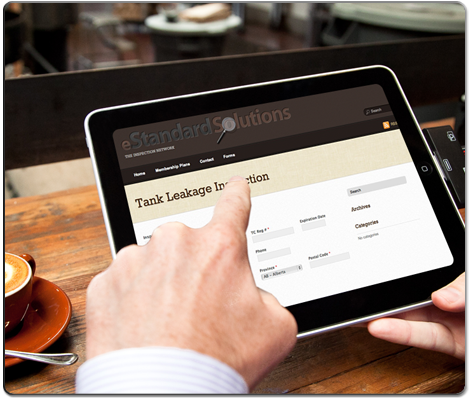 eStandardSolutions.com offers Inspectors, Facilities, Consignors and Tank Owners a resource to help eliminate costly mistakes by harnessing the power of the Internet to streamline inspection documentation requirements and grant access to data – anytime, from anywhere. eStandard Solutions Inc. also provides compliance based CSA B620 training, Quality Control manual compilation and B620 facility reviews. Growing database and resource site for inspectors, testers, facilities, tank owners and consignors. Inspectors can add new records, as well as review, edit and update their previous inspections. Members can search and access all data associated with their account. General tank specs and current disposition reports via serial # search can be viewed by all members. Access or upload image and document files pertinent to inspections for maximum accuracy. Members have access to a growing archive of knowledge generated by member Q&As. If answers can’t be found in our knowledge base, members may submit a support ticket for assistance. Streamline your inspection process and access inspection forms or results from anywhere, anytime. Memberships available for Inspectors, Testers, Facilities, Consigners and Tank Owners.